The Bloomsbury Group's reissues are almost always must-reads and this -- one I'd never heard of -- turned out to be pure delight. The deck steward, an ex-fighter with sloping, powerful shoulders, approached them. "Excuse me, sir," he said. "Do you know anything that will dissolve chewing gum? Something that won't dissolve a dog?" The first mate and the purser exchanged glances. "Them?" asked the first mate. "Yes, sir. One of the border collies in the hold. Its muzzle is glued together. They just thought he'd like a wad of gum, the little bastards." "In two world wars thirty-three men have left to fight for their country. Only one has come back alive. See that Mountie on the dock? He's the fellow. All the rest killed, down to the last man. If there such a thing as a dead island, this is it." The island has no idea what's going to hit it. The children, who are nothing to do with each other, are exceedingly unprepossessing. 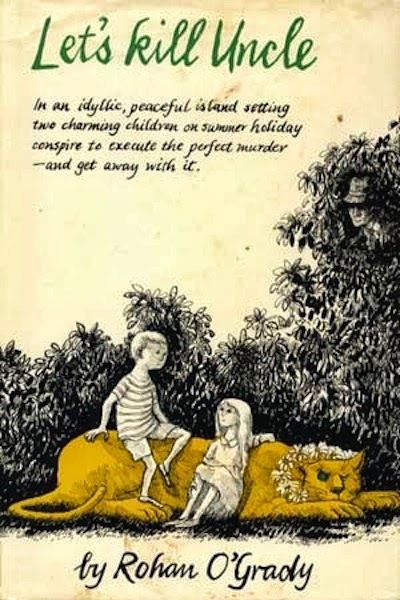 The girl, Christie, has come to board on the island for the summer to give her a holiday from her single mother, while Barnaby is supposed to be holidaying with his uncle, but the uncle hasn't turned up. Fortunately, Mr and Mrs Brooks at the store volunteer to look after the boy while his uncle is contacted. But things start badly because on the boat trip the children have decided they are sworn enemies. Of course the adults don't realise this and next morning Barnaby sent to play with Christie in the expectation that it will be nice for them both. Mayhem ensues, and the Mountie has to intervene. The children and their troubles are real and immediate, their bickering and ingratitude a very plausible reaction to their bewildering new circumstances. Christie finds herself unwittingly echoing that earlier exile, Heidi, with her bed in the attic of the goat-lady's house. Barnaby, meanwhile, becomes an instant substitute for the Brooks boy who went off to war -- expected to eat Dickie's favourite supper of bread-and-milk he throws the bowl in fury at the wall. Fortunately, the goat-lady, Mrs Neilson, and Sergeant Coulter know how to set some boundaries. Not necessarily any consolation to the long-suffering border collies though. I suspect that the rather joky appearance is an indication that the film will clumsily eradicate the subtlety of the writing -- although the humour is black, it is gently so, and if Uncle may be something of a comic-book villain, his intended victims belie it. The other adults, in contrast to Uncle, are thoughtfully portrayed, especially the Mountie who, as the only one to make it back from the war, has his own poignant story -- not at all the stuff of horror films. It's not intended to be a children's book, but young adults would find much to enjoy and, as you must have gathered reading this blog, I'll have no truck with adults who think books with child protagonists beneath them. 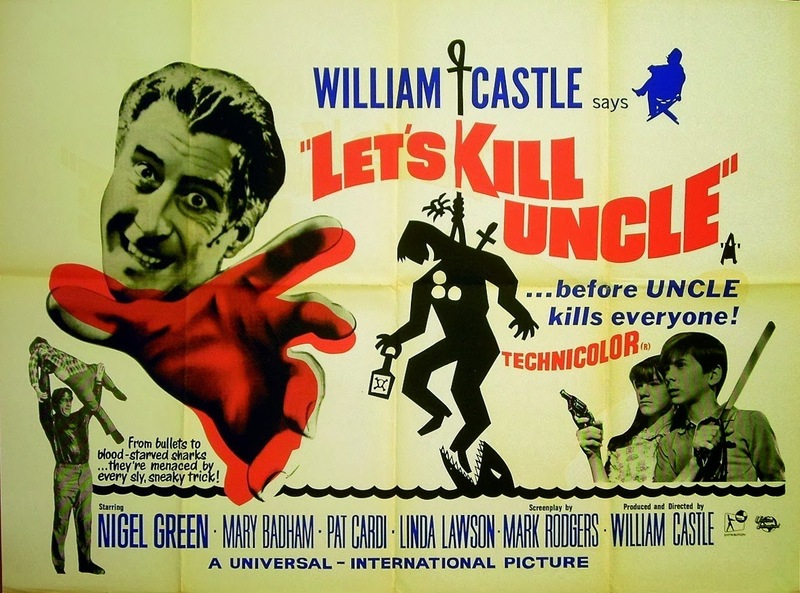 But anyway, the wit and originality of Let's Kill Uncle should be enough to charm the hardest of hearts. Reading this book was a little like finding that I'd somehow missed one of the Swallows and Amazons series, because The Salt-Stained Book takes you straight back to Ransome's world. Its child hero is a second John Walker, known as Donny, and Amazons Nancy and Peggy are much in evidence in the guise of Xanthe and Maggi Ribiero, two experienced young sailors who befriend Donny when he is sent to live at a foster home in Suffolk. At first, Donny doesn't really want to know them as he's too battered by recent events: his granny has just died, his deaf and dyslexic mother has been hospitalised and, although he knows his Great Aunt Ellen is on her way to Felixstowe from Shanghai, no-one will believe him. He's never met Great Aunt Ellen, she's never been back to England during his lifetime and the only information he has about her is in a cryptic telegram. Donny and his mother Skye decided to set off from Leeds to meet her but it all went horribly wrong once they got to Suffolk and now Skye's locked in a secure ward and Donny is being cared for by vicar Wendy and her husband Gerald, well-meaning people with lots of house rules and four other foster children. Everything looks bleak, but then Donny, who's never been near a lake in his life, discovers sailing and takes to it like the proverbial duck. The duck cliché is apt, because the author Julia Jones and her family own Arthur Ransome's yacht Peter Duck and clearly the whole lot of them have webbed feet. Her parents knew Ransome and she obviously grew up steeped in Swallows and Amazons and all things nautical. This familiarity makes this first part of the Strong Winds trilogy a terrific little book, and it ends with the implied promise that the sequels are going to be every bit as good, full of wicked villains and pirates and boats in a contemporary setting that could prove the ideal way to tempt a modern young reader into exploring the original books (come to that, they might tempt a few adults as well!). Parents beware! as they may also tempt young readers into trying sailing (as Swallows and Amazons did me), in which case you might end up spending a good deal of time hanging around in chilly conditions watching your more robust offspring repeatedly capsizing and righting a dinghy. I don't want to talk too much about the book because I don't want to give the story away. There's a wonderfully nail-biting finish that'll keep you up way past bedtime and the villains are suitably nasty (though some villains follow a very Arthur Ransome route, too – a nice touch). And if Donny's situation seems very dire at the start, there are good things to come as he discovers his affinity with boats, makes new friends among both children and adults and begins to learn things about his own past and family. I loved all the child characters, but especially Anna, the oldest of the children at the vicarage - I do so hope she'll appear again. Finally, I'm torn over buying the second and third part of the trilogy – my shortage of bookshelf has become a serious problem and I'm trying to buy new books only on Kindle but these are so nicely produced! They are self-published and look and feel lovely, with little line drawings at the ends of the chapters and beautiful covers. I desperately want the full set to sit snugly somewhere to hand, ready to be leafed through or re-read, because these are books to treasure. I really can't recommend them too highly – they'd be great for reading with younger children, or as a gift for good readers from 10 or 11 upwards. The complete series is, in order: The Salt-Stained Book, A Ravelled Flag and Ghosting Home. Here it was, between a white stone cross on one side, and a plinth with a kind of toddler-angel on top, on the other. A plain tombstone, with a plain inscription. First of all: IN MEMORY OF JAMES TRANTER, and a date half a century earlier. That would be her grandfather, her father's father. Then, below: AND OF HIS SON ALFRED ROBERT TRANTER, and then the date of her own birth: the very day and month and year. On an impulse, Kate leant forward and traced with her finger the lettering of the name and the date -- her date. Kate Tranter is the youngest member of her family. Her two brothers are rather older, and Kate is a lonely child, a little isolated within the family and reserved at school. She's curious about her dead father - he must be dead, the gravestone proves it - but her mother and grandmother are reluctant to talk about him. She found the grave on her own, and doesn't tell anyone that she visits it. Only Syrup knows, but being a cat, he doesn't give her away. As well as the mystery of the gravestone, there's the strange circumstances surrounding a letter which arrives for her grandmother, which disappears almost immediately and no-one will talk about it. Then one day the tombstone disappears, and with it all Kate's certainty about her father. A conversation with her brother adds a new piece to the jigsaw, though, a place called Sattin Shore where someone drowned. So Kate decides to visit this place for herself. Despite her isolation, there's a lot of family life in this book. Both brothers introduce Kate to new experiences and, although Kate's mother can be loving and warm. But there's a darkness at the heart of the family: old Mrs Randall, Kate's grandmother, is cold and withdrawn, and exercises too much influence over her daughter. It is she who decides that Kate's father will not be mentioned, and that his children must forget all about him. She lives on the ground floor, next to the front door, and Kate is reluctant to even pass her partly-open doorway -- she's a brooding presence throughout the book, oppressive even at times of happiness, and a cause of family tensions. But if I make in sound like unalleviated misery, it's not. There's fun, too, in a sledging in the snow, a growing friendship at school, and the gradual sense of discovery about the past. And through it all, a purring golden thread, the presence of Syrup, rendered so beautifully that you can almost feel his thick fur, and his toes curling and uncurling in pleasure. I can't recommend The Way to Sattin Shore too highly, it's told sensitively and with humour and Kate is one of those characters who stays in your mind, prickly and inquisitive and cautious all at the same time. Her inability to ask the questions that she needs answers to is compelling and completely convincing. She's a real person. 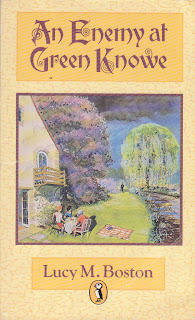 As a child, the only one of Lucy Boston's books I read was the first, The Children of Green Knowe. 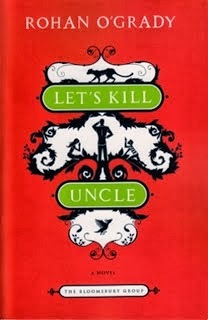 At the time I think I found it a little wordy, but it stuck in my head ever afterwards, so that it was with enormous pleasure that I've rediscovered the series as an adult - if I still have one left to read, it's because I'm rationing myself, because to begin one is to be lost in a world of enchantment. Old houses and gardens are equally beguiling, and a story which combines both is perfection. You can see a little of that enchantment, I think, in the cover illustration, which is by L.M. Boston's son, Peter, and shows the "real" Green Knowe, the manor at Hemingford Grey near Cambridge, which she bought in 1939. This is one of those instances where house and garden are characters as important as the people, and the stories all reflect the author's love for her surroundings and her home's imagined history. You can read some of that history here, in an interview with her daughter-in-law, Diana, who now runs the house. 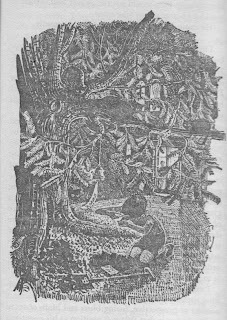 In An Enemy at Green Knowe, Tolly, whom we met in the first book, and Ping, who was introduced in The River at Green Knowe, are spending a holiday with Tolly's grandmother, Mrs Oldknow. Soon after their arrival, Mrs Oldknow receives a letter from a Dr Melanie Powers, asking to visit the house to search for rare manuscripts associated with one of Green Knowe's earlier residents, the black magician Dr Vogel. Hard on the heels of her letter, Dr Powers turns up, and proves to be unpleasantly pushy and insinuating, not in the least prepared to accept that all Dr Vogel's books have been destroyed. She quickly proves to be a very real threat and it takes all their combined resourcefulness to hold her at bay. I've seen other reviewers commenting on how dark this book is compared to the others in the series. For me, that's not a negative, nor is the introduction of witchcraft. There are certainly places where you hold your breath with anticipation - Dr Powers is genuinely scary - but the frightening episodes are over quite quickly, and not protracted in the way they might be some more recent novels, or in a book aimed at slightly older children. There are minor victories along the way, allowing for bedtime readings which see Tolly and Ping secure within the walls of Green Knowe for another night, at least. 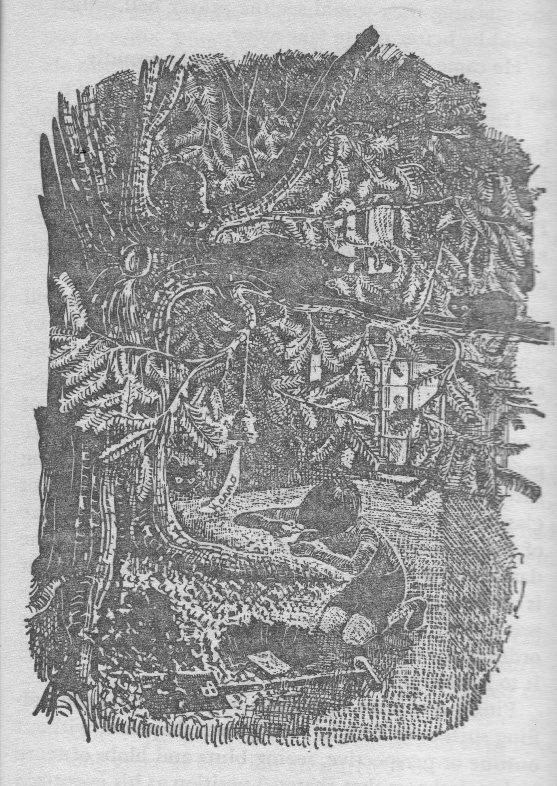 Peter Boston's illustrations are an essential part of the Green Knowe books - done on scraperboard, they are rather hard to reproduce here as the paper quality of my Puffin edition means that it doesn't scan well, but I think you can see the intricacy that makes you want to study the detail. They provide the perfect reflection of the delicacy with which the stories are told, and their deep sense of magic and history. The best of them all is The River at Green Knowe, and I'll talk about that another day, but they are all magical, and can all be read on their own, each creating a perfect world which welcomes and surrounds the reader. This is the final one of the Fell Farm books, set the Easter before the children's parents return from abroad, when they expect everything may be about to change. The holiday nearly doesn't come off - Fell Farm, which is a National Trust property, has the builders in, and there's no room. Happily, they think of camping, and the Jenks can squeeze young Sally in despite the work, so they can go ahead, which is just as well really, as there's not much room for them all in Aunt G.'s London flat either, and she's very anxious about whether the neighbours will complain when they are all there at once. Once they get there the children set up camp by the tarn quite near the farm - far enough away to be independent, but close enough to be able to collect milk and other supplies easily, and for Sally to run messages between the two, which pleases her. They also all return to the farm once a day for a proper meal, cooked by the bountiful Mrs Jenks on oil stoves in the big barn. The rest of the day they are free to roam, whether it's just to collect wood (pig-sticking) to keep the camp fire going, or to set off on one of their mammoth hikes across the fells - they are indefatigable walkers! Just after nine they started along the edge of the little Heron Tarn, scrambled over the wall into the narrow mountain road and turned sharply right downhill. The whole length of that rough, twisty little lane dropping steeply down to Oxenfell, gave the most tremendous views across all the ridges and deep cut valleys towards Wetherlam, Bowfell, the Langdale Pikes, and the rest, and they discussed the route as they tramped down with the whole region spread in front like a map, fullscale and gloriously coloured. Various adventures occur - brushes with fellow campers, a hunt for a sheep-killing dog...Jan and Hyacinth set off on a birdwatching expedition which nearly ends in disaster again. The story romps along, told in the third person this time: Hyacinth is on strike and says she won't keep a journal as there will be lots of other work to do while they are camping (indeed, Kay seems to spend all her spare time darning socks!) These are certainly books to charm the adult reader, but I think that a child who enjoyed the outdoor life might find much to entertain, as well, and I well remember day-dreaming about being able to go off on camping holidays when I was a child (conveniently ignoring my dislike of midges, aversion to spiders and preference for a comfortable bed, even then). There are pleasing cat and dog characters too. 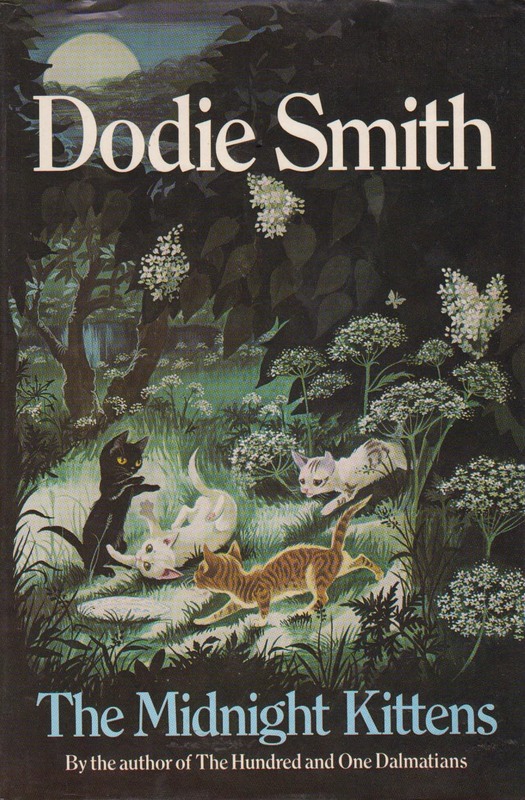 Something of an oddity, The Midnight Kittens was first published when Dodie Smith was 82, when it came out as the same time as the second volume of her autobiography, Look Back with Mixed Feelings. I suspect it works best for the generation for whom 101 Dalmatians was a newly published book - they'll be able to read and revisit their childhoods. For children now, the headmaster whose methods are "modern" and based on counselling theory, and the twins' school, will seem odd, and the hippy squatters will be an anachronism in a time when travellers are mostly feared and despised. 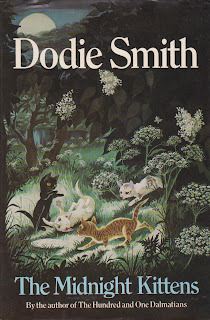 It's the story of Tom and Pam's half-term visit to the grandmother who has cared for them since the death of their parents, and the four kittens who come to eat the food put out for the hedgehogs. It's a very slight story and its brevity makes it seem unnecessarily hysterical, I'm afraid. 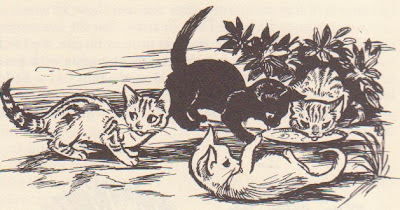 A more leisured pace would have allowed some time to put the children's fears for the kittens into perspective, while also foregrounding the adventure which follows their meeting with the past owner of Freke Hall. The book's real magic now is in the enchanting illustrations by Janet and Anne Grahame Johnstone. However, it might be rather nice for reading aloud, and perhaps there are still old-fashioned little girls who would enjoy reading it for themselves. It's a little late to be writing about this, but the temperature has just dropped sharply as the sun set, so not too inappropriate! We were somewhere between Hest Bank and Carnforth - the bit where the railway runs along the edge of the sea, and you usually get the first view of the fells, looking simply wonderful across the great curve of the bay. But this time it was half past four on an afternoon in late December, and the light had gone from the sky, except for some long, dim bars of gold just above the horizon. I swore that I could just glimpse the faintest gleam of snow-caps, pale as silver. The others said that it was imagination, and maybe it was; but it really didn't matter, because we all knew that they were there. Hyacinth, our narrator, combines a romantic imagination (she has her notebooks with her, so that she can continue writing The Mystery of the Blood-Stained Hippopotamus during the holiday) and down-to-earth practicality about things like supplies for walks, and we're plunged straight into farm life and long tramps round the fells. In one of my favourite chapters Hyacinth's twin Jan rescues a heron which has got trapped in a pond, frozen in while fishing. A few years ago I rescued a heron myself, and could share their wonder at being so close to such a remarkable bird, and their pleasure in its return to health. The sheep rustling scene, on the other hand, would make any modern parent's blood run cold, I fear! And I can't think that many children wash their own socks these days, more's the pity. Fell Farm for Christmas is an attractively brisk romp, the sort of holiday children of my generation dreamed of, with lots of fresh air, hearty food and adventure. It was published the year I was born and the past is a golden place in these pages. My own holidays weren't so eventful (I never knowingly met a sheep rustler! ), but otherwise not so very different from what is described here. I shall pass it on next to my mother, who spent the war not far from Carnforth, and still gets wistful about it. Oh, and there are maps. I do like a map and they are suitably Wainwright-ish.